It will be Foster Care and Adoption Awareness Night at Grand Canyon University’s basketball game Thursday, and Ahnjellyka Duque-Parks hopes more than a few fans in attendance get the message and act. 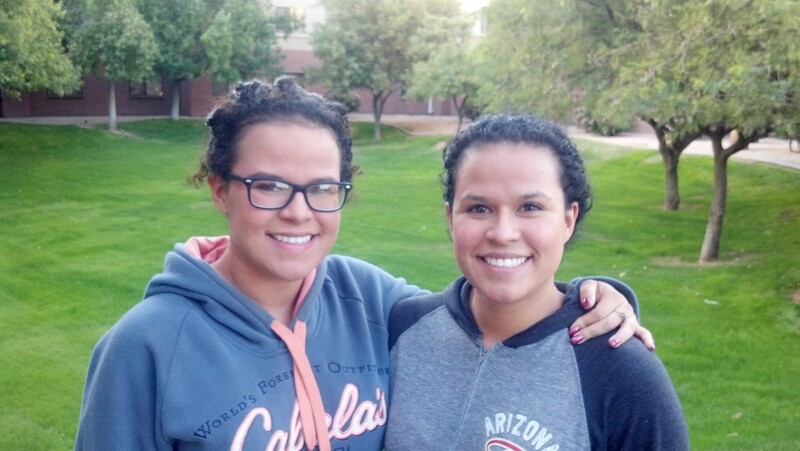 For Ahnjellyka and her twin sister, Angela, it’s a personal story. Seven years ago, they and their three siblings, sisters Elvia and Katalina and brother Diego, were removed from their home by authorities because of abuse and neglect and put into foster care. Now the twins are 18-year-old freshmen at GCU and thriving thanks to the love and support of their foster parents, Dave Parks and Cherry Duffy-Parks of Phoenix. GCU has partnered with Arizona Foster Care Initiatives, Arizona’s Office of Faith and Community, Children’s Heart Gallery, Arizona Friends of Foster Children Foundation and City of Grace to raise awareness and education about the opportunities surrounding adoption and foster care in Arizona. The Arizona Heart Gallery, which displays pictures of children who are seeking a “forever home,” will be in the lobby of GCU Arena for Thursday’s game. The twins were lucky to find one on May 3, 2007, a date seared in Ahnjellyka’s memory. Their sisters were sent to group homes and visit the twins occasionally, but to this day they don’t know what happened to Diego. They have not seen him since. He was 4 at the time. At first, the twins weren’t quite sure what to make of their new environment. Angela said she held out hope of being reunited with her family, and the twins did visit their parents occasionally. But they quickly grew close to Dave and Cherry, who once was a foster child herself and desperately wanted to have children but was unable to conceive. The girls were officially adopted on National Adoption Day, Nov. 20, 2010, another date they have committed to memory. At that time, they tacked the Parks’ name onto their own, and Ahnjellyka used it as an opportunity to change her first name from Angelica. She just wanted something really different. “And everyone called me ‘Jelly’ anyway,” she said. The twins refer to Cherry and Dave as Mom and Dad and have been so inspired by their example, they both want to devote their lives to helping people. Angela is double majoring in elementary education and special education, and Ahnjellyka wants to use her sociology major to help homeless people. They received scholarships through their foster care organization, Hope & A Future, and from GCU for their grade-point averages. “They understand what a blessing they have in front of them,” Cherry said of her daughters. And what a blessing they’ve been given by Dave and Cherry. The twins try to go home weekly to visit their parents and admit that they still can’t quite believe their good fortune. They hope the Arizona Heart Gallery inspires people at the game Thursday to do the same for needy children residing in group homes. According to the Arizona Foster Care Initiatives website, the number of children needing foster homes has increased 40 percent in the past four years, and adoptive families are needed for more than 600 children who live in group homes and are ready to be adopted. They need someone like Dave and Cherry. Maybe some couples just like that will be similarly inspired Thursday night.